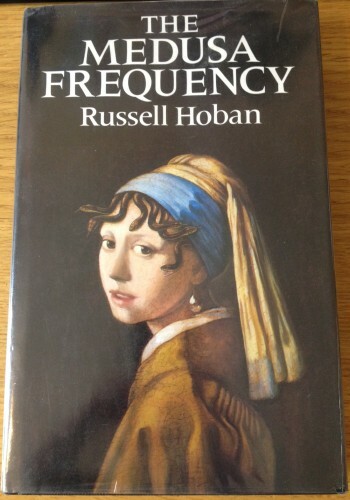 russellhoban.org speaks to Frances Broomfield, who painted the cover of Russell Hoban's 1987 novel The Medusa Frequency. 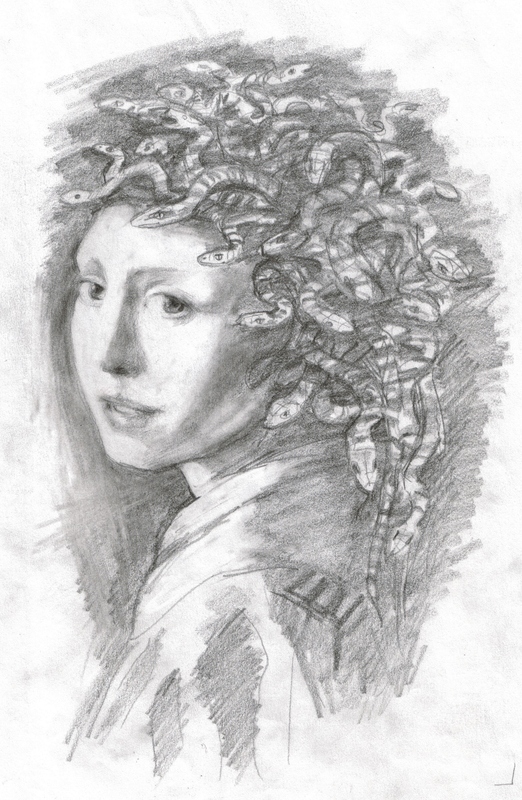 The Medusa Frequency is narrated by comic-book artist and "failed novelist" Herman Orff, who is preoccupied with "certain obsessions, certain ideas" including the mythological beast The Kraken, the story of Orpheus and Eurydice and Vermeer's haunting portrait Head of a Young Girl. The book is in a sense a study of female archetypes, as Orff pines for his ex-girlfriend Luise and pursues new love Melanie, a journey which takes him around London hallucinating the dismembered head of Orpheus, who warns him against Medusa, and to The Hague in an ironically fruitless search for Vermeer's original painting. russellhoban.org: Frances, who and what are your influences as an artist? FB: I admire the work of contemporary idiosyncratic artists, such as those who exhibit with Portal Painters, and I'm influenced by earlier artists, particularly Henri Rousseau, Richard Dadd and Cecil Collins - James Marsh is my favourite illustrator. Writers have also been an influence, especially Lewis Carroll, Edward Lear and Ivor Cutler, who I once collaborated with. I also find subjects to paint in the works of poets such as Rimbaud and Gerard de Nerval, and also in folklore, mythology, symbolism, alchemy, C G Jung, dreams, nursery rhymes and fairy tales, popular culture, music hall and fairground art. Do you mostly do commissions and illustrations for book covers or do you have a personal collection as well? I am primarily a painter, producing my own work, which is exhibited with Portal Painters, and my paintings are in public and private collections around the world. Over one hundred images of my paintings are on file with Bridgeman Art Library for publishers, designers, manufacturers, and others to consult. I've also been commissioned to work on specific projects as illustrator and designer, and my images have been seen on greetings cards, bookjackets, postcards, tea towels, posters, prints, and most recently on an iPhone cover. How did the commission for The Medusa Frequency come about? Well, at about that time I was showing my portfolio to various publishers in London, looking for illustration work, and one day, December 17th 1986, I went to see Ian Craig, Art Director at Jonathan Cape, and he gave me the brief to produce roughs for the cover of The Medusa Frequency - it was to be based on Vermeer's painting Head of a Young Girl, and to incorporate snakes in the head dress. I went back about three weeks later to show him my drawings. Were you given a copy of the manuscript prior to doing the painting? I seem to remember being given a manuscript copy to read. It was unlike anything else I had read at the time, and I wasn't sure what to make of it. 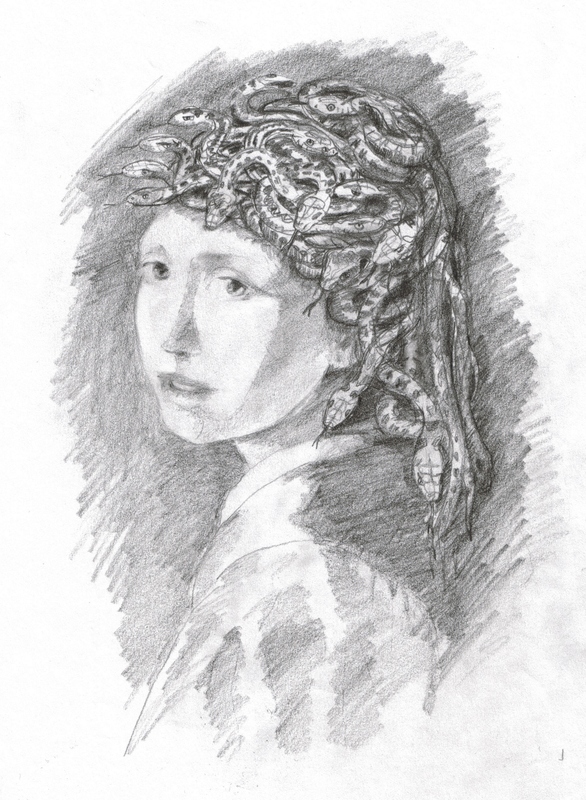 Who thought of the image of the Vermeer Girl adapted with the Medusa snakes? The concept had already been decided on, before I became involved. I was asked to produce artwork to a brief, and I'm not certain who chose the image, Russell Hoban or Ian Craig. What does the image suggest to you? Has your interpretation of the image (or the book) changed at all over the years? Although I did the painting, I was simply working to a brief, interpreting someone else's concept. And although containing elements of my own style, and informed by my own choices in regard to execution, for me the image remains an enigma. I haven't read the book for a long while, but I feel now I have a deeper appreciation of its underlying themes. Vermeer's "Head of a Young Girl" has been popularised in recent years by the Tracy Chevalier novel and Scarlett Johansson film. Was the image as iconic and well-known in 1987? As an artist I was certainly aware of the painting, but I don't think it was widely known. At the time of course, before the internet, there were fewer sources of information and less accessibility of images. When I was given the commission for the book cover, the publishers could only supply me with a postcard of the Vermeer painting, but by chance I had a large reproduction in my own collection of reference material, and I worked from that. 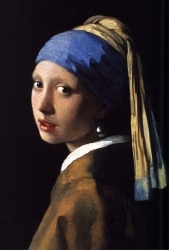 The novel's narrator Herman Orff is obsessed with the Vermeer original (as was Russell Hoban). What are your own thoughts on it? It is a beautiful painting. Did the manuscript prompt alternative designs or images for the book cover at any point? The basic image, the fundamental idea, had already been decided on, and I wasn't asked to come up with alternatives. 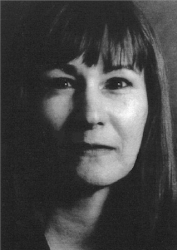 I was given the manuscript simply to provide me with a sense of the atmosphere of the novel. What did change, or evolve, was whereabouts on the head I should add the snakes. My first thought was to incorporate the snakes as part of the head dress, possibly as Archimboldo might have done - in fact I tried several versions with this approach and showed the preliminary designs to Ian Craig, who then discussed them with Russell Hoban. It was finally decided to go with the concept of the snakes emerging from the head dress, rather than being part of it. The image coalesced, and I then got on with producing the the finished artwork. How did you approach this painting technically? It captures the light of the original Vermeer beautifully and even the cracks and reticulations are reproduced. Did you do any research on the painting or Vermeer's techniques beforehand? The brief, the intention, was to produce a "faithful copy" of the Vermeer original, so I didn't attempt to duplicate it in terms of materials and technique, and little research was required in that respect. I simply concentrated on getting the appearance as authentic as I could, at the same time incorporating the snakes in a realistic, organic way. The proportions I was asked to work to were 3 x 2. I added "bleed" to allow for cropping, and painted the image about 50% larger than finished size, so that it could be reduced to the required size for the book cover. This of course was all before Photoshop was generally available. The finished piece [see below] is 16 x 12 inches (40 x 30 cms), painted on an mdf panel with a gesso ground, using oils and tempera, a technique I still use today. This enables me to build up the surface in layers, while allowing the white gesso ground to reflect light back through the paint, giving the impression that the picture is lit from within - a quality I noticed about the original and wanted to reproduce. Once the image was complete I painted the cracks over the surface using tempera and a very fine brush. Finally I added a glaze of oil paint. I delivered the artwork to Jonathan Cape on 30th January 1987 and the book was published later that year. Your Portal Gallery bio refers to your interest in Jungian/alchemical imagery and the archetypal imagination. The novel has a lot of those sorts of influences - is that why this image and/or the book appealed to you? Very much so. Around this time I was planning a series of paintings on the theme of Shakespeare's Tempest. Through researching this I met Noel Cobb, author of Prospero's Island - The Secret Alchemy at the Heart of The Tempest (London: Coventure 1984). Noel gave me an insight into the archetypal imagination, and helped me to understand some of the alchemical imagery in Shakespeare's play. And by coincidence he knew Russell Hoban, and wrote about The Medusa Frequency in his own book, Archetypal Imagination (Lindisfarne Press 1992). Did you have any direct contact with Russell Hoban over the painting/commission? Did he comment on it? Unfortunately I didn't meet Russell Hoban, and never dealt with him directly, but Ian Craig told me that he was pleased with the artwork for the book cover. Do you know who owns your illustration now? Is it possible for the public to view the original? I have the original painting in my archive. I showed it once in a small exhibition of my illustration work, but it's no longer on public display. Have you read any of Russell's other books? Are you a fan? No, I haven't read any of his other books - I tend to read mostly for research and reference, but I'm certainly a fan, if only on the basis of that one book. Your Portal Gallery biography says you have a special affection for eccentric writers such as Edward Lear and Lewis Carroll. Would you put Russell Hoban in this same category? I find a continuous source of inspiration in the works of Lear and Carroll, they both touch on deep psychological and symbolic truths in a spontaneous, unconscious way. I feel that Russell Hoban's approach is more aware, more knowing. He uses symbolism in a more conscious, controlled manner. He seems to have more in common with writers such as Hermann Hesse. I'm presently working on a painting and have several more ideas for paintings, based on Ovid's Metamorphosis. And of course there's always a Lewis Carroll-inspired work in the pipeline, to start the New Year. Are you exhibiting currently and/or have any work for sale? My current paintings which are for sale can be viewed on the Portal Painters website, or by appointment with the Gallery. Over 120 of my images may be seen at Bridgeman Art who license my reproductions. Frances, thank you so much for taking the time to speak to russellhoban.org and very best wishes for your work in 2013. I've enjoyed answering these questions, and look forward to the finished piece.